It’s been another busy week for me! (I think they’ll be like this forever.) But I am very grateful for all of the wonderful that is happening in my life. I am being given some amazing opportunities. 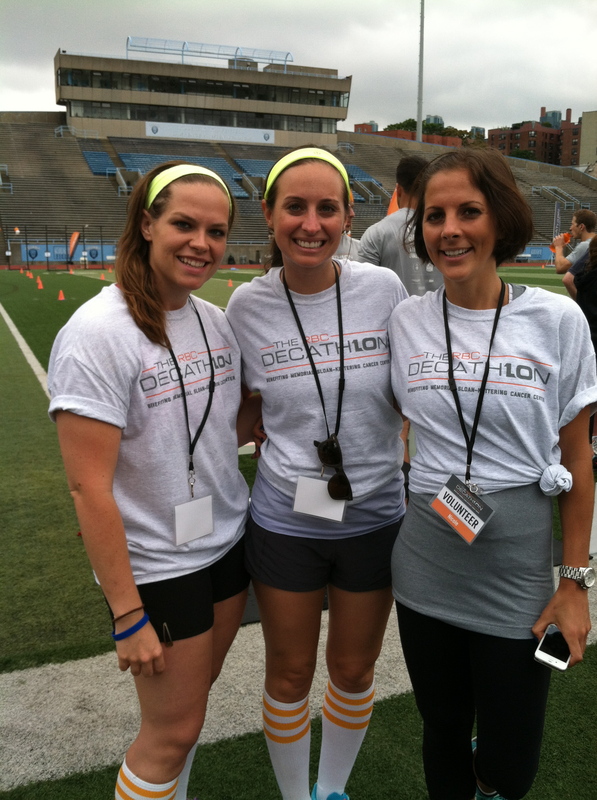 I had work off this past Sunday but woke up bright and early to head WAY up to Columbia’s football field for the RBC Decathlon. It’s guys from Wall Street who raise money to benefit Memorial Sloan-Kettering Cancer Center. This was my heat doing the dips. 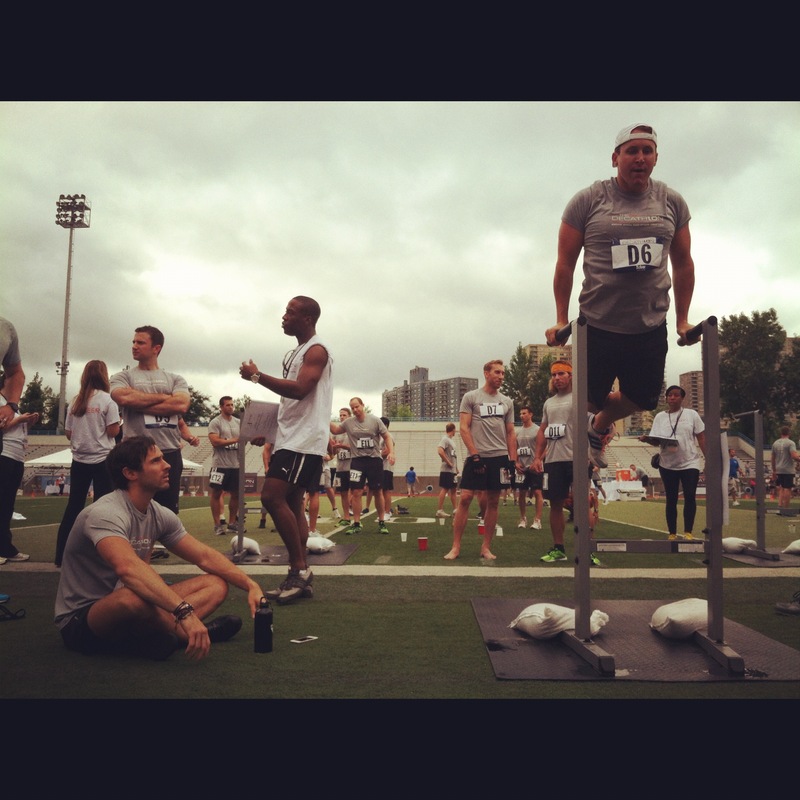 The volunteers were each assigned a heat to support throughout the day by cheering, helping count reps, etc. Along with dips, the other events were 400 m run, 40 m dash, 800 m run, pull ups, football throw, bench press, cone/agility drill, vertical jump, and rowing. Apparently, rowing was the most difficult more most of the guys. Of course my favorite event was the football throw. I was a retriever so I had to get the ball back to be thrown again. One guy threw a beautiful spiral 69 yards!! (He won this event.) I cannot throw a football but was happy when I actually made it spiral a bit. My arm, shoulder, whole right side body was sore for at least two days after. 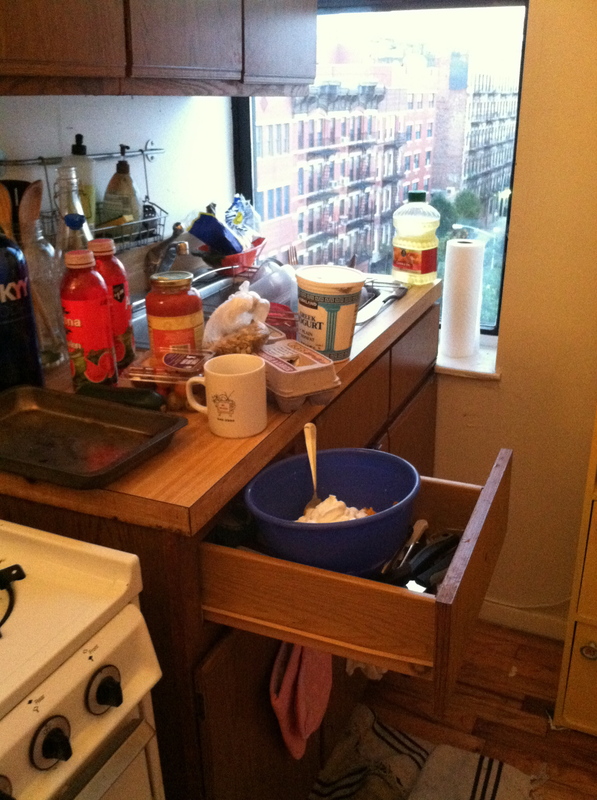 I had some adventures in my kitchen this weekend. After the decathlon I decided I really wanted to make pumpkin bread. I went to the store and got all of the ingredients, but when I returned home I realized we don’t have any measuring cups or measuring spoons. Simple solution? One tablespoon (kitchen spoon) is 1/16th of a cup. This kind of worked, but pouring three cups of flower took a while. It was more challenging when using the salt and baking soda. I eyeballed teaspoons best I could. The bread wasn’t my best but it’s edible, especially with some almond butter on it. Emily came over and she helped make dinner. 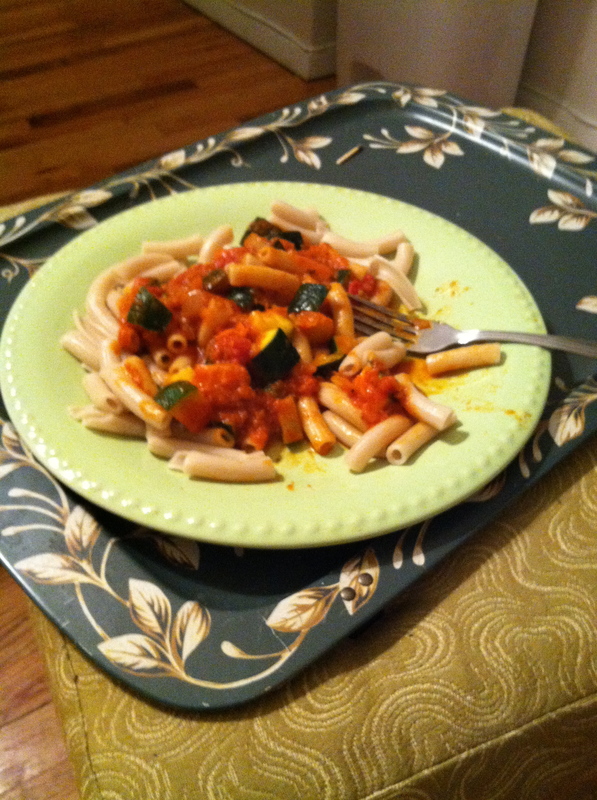 Pasta with vodka sauce, zucchini, onion, and tomatoes. It was actually very delicious and nice eating a home cooked meal for the first time since I moved here! There’s a new yoga studio around the corner from my apartment, Stanton St. Yoga. I took my first class there Tuesday morning and absolutely LOVED it. It’s a good mixture of hatha and vinyasa flow yoga. It you live anywhere near LES you must stop by. The studio has two sisters who are instructors and they are both amazing. It’s also part of a bed and breakfast. 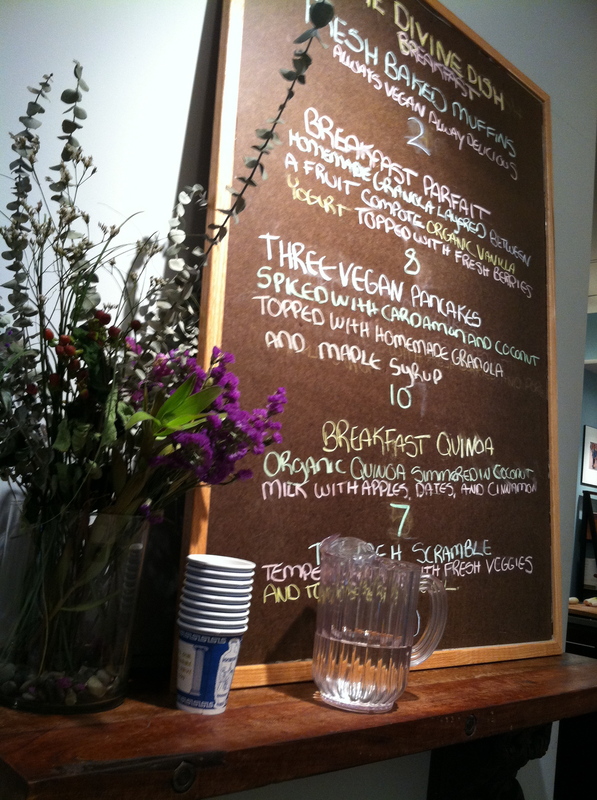 The food at the cafe is to die for (see menu above.) After a wonderful practice I had the Breakfast Quinoa. Scrumptious! With my marathon now 3 months away I decided I should start running more than once a week. So far this week I’ve run twice! 🙂 Monday morning I was convinced to run 9 miles. 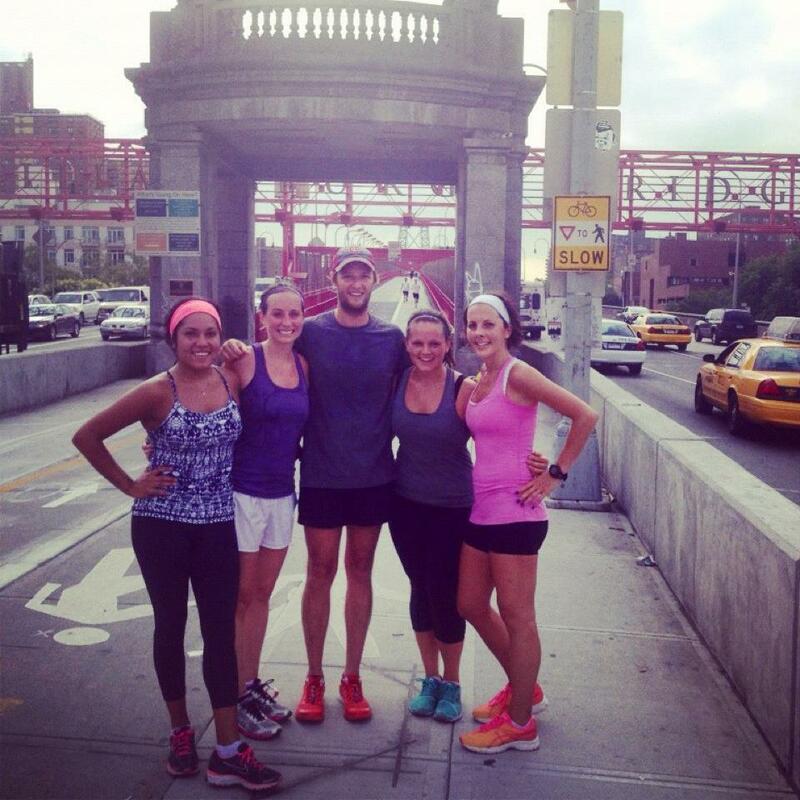 We ran across the Manhattan Bridge into and all around Brooklyn (this was a nice running tour as I haven’t spent much time there) and then came back home across the Williamsburg Bridge. This bridge by the way has quite an incline up it! I felt so great after the run! Thanks Tom and everyone who ran with us! I went for my first early morning run in a while and loved it. I ran along the East River and when I turned and saw this it just took my breath away. 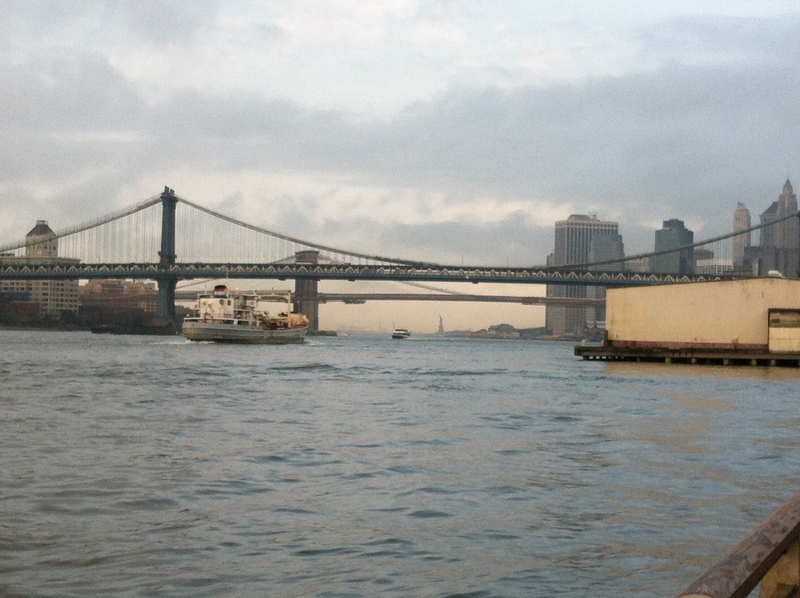 Manhattan and Brooklyn Bridge, Statue of Liberty, downtown, Brooklyn, WOAH! I am so grateful to be able to live in this city and have this incredible life! Off to try out a new circuit training workout! Yes it did. Fractions fractions fractions! Congrats on the new job! !